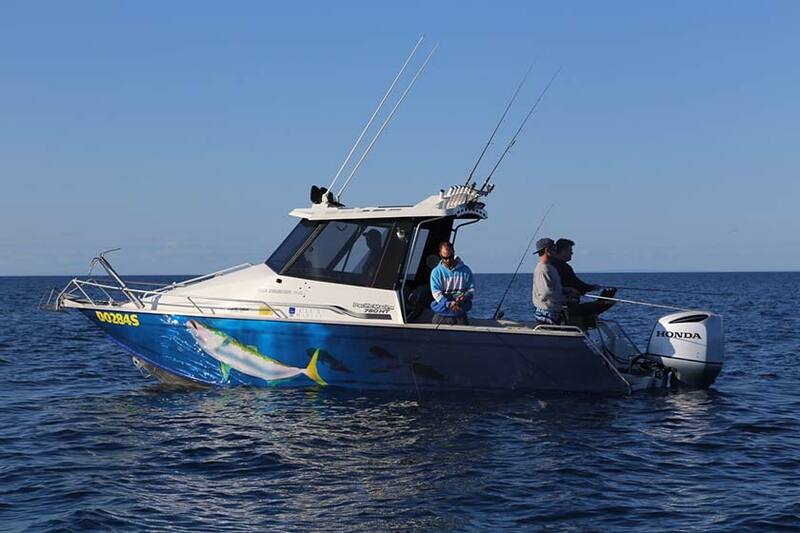 As you may have seen in this video with SA Angler magazine publisher Shane Mensforth a while ago, he loves his 780HT! This is the second Bar Crusher boat Mensforth has owned and he has no intention of ever letting this one go. Inline with his comments in the video: “I love this boat so much, when it gets a bit untidy I’ll just tidy it up, put it back in the water and keep on fishing”… that’s exactly what he’s just done! It’s hard to believe, but our Bar Crusher 780HT recently turned three years old. We’ve done nearly 400 engine hours, travelled a lot of sea miles and caught some pretty nice fish along the way. This is normally the time I’d be thinking about putting the rig on the market and getting into a new one, but after a fair amount of discussion we’ve decided not to. The 780HT is so well set up now and everything is still purring along so nicely, there’s simply no need to turn it over. Instead, we’ve opted to give it a ‘birthday’, with some new paint, a completely new electronics package and even a vinyl hull wrap. As is the case with all aluminium boats, ours has picked up its share of chips and scratches over the past three years. Most of the chips have come on the highway, as sharp stones are thrown up and slammed into the paintwork. It’s virtually impossible to avoid, particularly so if you do a lot of highway miles with the boat on the back and, at the absolute extreme, if you tow over dirt roads on a regular basis. To protect our freshly-painted Bar Crusher and the vinyl wrap, we’ve arranged for a ‘boat bra’ set up to be fitted to the trailer, which shields the hull from stone damage on the road. As our Bar Crusher does a lot of serious fishing, we’ve also accumulated some annoying chips and scratches around the gunwales… these are inevitable, regardless of how careful you try to be. Things like wire-ring crab nets, gaffs, sinkers and tag poles chop away at the gunwales of any boat over time. Although we keep on top of things with a touch-up brush, they’re a frustrating fact of life. Consequently, we’re having the gunwales, side pockets and the entire top deck repainted to restore the boat to near-new condition. Jo Starling designed the artwork for our vinyl wrap. Jo is a talented artist/graphic designer and she came up with precisely what we were after – a design that’s significant to the way we fish and what we fish for… a stylised yellowtail kingfish pursuing a school of gar. It’s big, it’s bold and, as far as I’m concerned at least, it fits the image of our Bar Crusher perfectly. The original Humminbird 1198C sounder/chartplotter we’ve been running has served us very well, but we’ve now opted to head in the Garmin direction as part of the overall refurbishment. I’ve always wanted an autopilot, so we’ve installed a Garmin GHP 20 system with SmartPump. With long runs across the gulf part of our regular fishing itinerary, I’m looking forward to punching in a waypoint, setting a comfortable cruise speed and sitting back while the autopilot steers us to where we want to fish. Critical to the success of most fishing excursions is the sounder/GPS, so we’ve flush-mounted a new Garmin GPSMAP 7412xsv at the helm. In fact, we’ve decided to fit two multi-function displays, with the slightly smaller Garmin GPSMAP 7410xsv bracket-mounted on the dash. Both touchscreen units feature the very latest dual-channel CHIRP, DownVü and SideVü technology. Those who are heavily into marine electronics would be aware of just how good Garmin technology really is – the reviews Garmin gear has received over the past six months have been incredible, and there’s no doubt we’ll be stepping into a whole new world of navigation and using next-generation sonar to find structure, baitfish and target fish. Meanwhile, the Honda BF250 has just been serviced and, due to a minor problem with some of the cowling baffles, the motor now has a brand new lid. During 400 running hours, it’s scarcely missed a beat in the three years it’s been on the transom. The only hiccup occurred last year when I ran the engine on stale fuel – something I’ll certainly never do again! It kept running, of course, but the inbuilt alarm let me know in no uncertain terms that something was amiss, and a tankful of new juice solved the problem instantly. With summer now just around the corner, there are plenty of great fishing opportunities about to pop up… and with our born-again Bar Crusher we intend to be right in the thick of it this season and for many more to come!